The Royal Dutch Mathematical Society (KWG) awards the Brouwer Medal 2014 to American mathematician John N. Mather (1942) from Princeton University. The medal is awarded only once every three years to a mathematician of the highest international level. The Royal Dutch Mathematical Society (KWG) awards the Brouwer Medal 2014 to American mathematician John N. Mather (1942) from Princeton University. The medal is awarded only once every three years to a mathematician of the highest international level. The medal will be presented during the 50th Dutch Mathematical Congress (NMC) in Delft on 16 April. CWI has been sponsoring the Royal Dutch Mathematical Society for a long time. 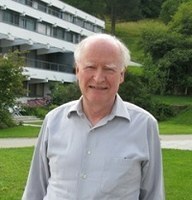 Picture: mathematician John N. Mather, source: Archives of the Mathematisches Forschungsinstitut Oberwolfach. Wiskundige John Norman Mather ontvangt Brouwermedaille 2014 Het Koninklijk Wiskundig Genootschap (KWG) heeft de Brouwermedaille 2014 toegekend aan de Amerikaanse wiskundige John N. Mather (1942), verbonden aan Princeton University.